Q: Does carpet repair have a value on resale of my home? A: Anytime that you have a house that is neat and tidy and it looks like the people have been taking care of the place and not letting this and that go, it is better for resale. Buyers who come to buy will have a better view of the people who live there and the idea that the house won’t need a lot of major or minor repairs. If it looks like even small stuff like carpet needs repair here and there, they will begin to wonder about the major repairs also. It won’t matter even if you have taken care of the major stuff. It’s the people perception which make them feel comfortable that they are getting a good deal. Q: Should I repair and or restretch the carpet now or wait till its ready to sell? A: Why not enjoy the benefits of a nice looking house while you still live there. Also repairs can cost more if you wait longer because they might get worse and the carpet can show a lot more wear faster if it is not stretched PROPERLY ! Q: Do you repair and or Re-Stretch carpet? 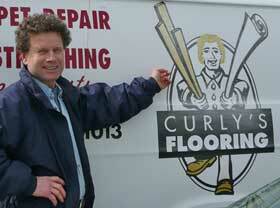 A: Yes we specialize in both small and big jobs that include carpet repair and carpet re-stretching. Many years ago we saw a need for people who have problem with their carpet and someone who could help them save money and help beautify their homes. Q: Is it worth Re-Stretching the carpet? A: This depends to a certain degree as how Important it is that you have the latest fad and or color. A good restretch can bring back a lot of the lustre and shine in your carpet It can give you peace of mind,knowing that you can delay that big carpet expense for years; and you might even sell the house before it needs new carpet. That saves money for a partial down payment for a new home. Q: Will the repair show? A: This depends on how worn or old the carpet is. Depends on how big the patch is. We do a great job of fitting it. but we can’t do anything about the color. Give us a call for an estimation. A: The cost depends on the size of the room to restretch and the difficulty of Re-Stretch. Repairs can very do to how many,the size,the difficulty,the type of carpet. The consultation of the work is FREE!!!!!!!!! Q: For Re-Stretches, do I have to move the furniture out? A: For the best job the room needs to be empty. It will save time and money. When anyone puts a new carpet in,it needs to be stretched both ways and the same with restretching. That can only be done with the furniture out. I am creative though and so if some of the furniture needs to stay in, I CAN STRETCH IT.